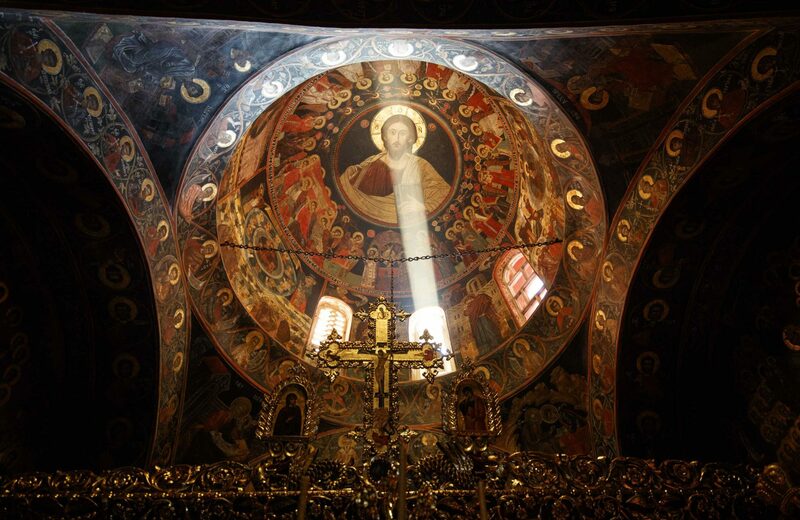 For us Orthodox the unique and absolute goal of life in Christ is theosis, our union with God, so that man – through his participation in God’s uncreated energy – may become “by the Grace of God” that which God is by nature (without beginning and without end). This is what “salvation” means, in Christianity. So, as Christians we know that salvation is an ongoing process that, as believers, we are called to cooperate in. We are instructed to “Repent, for the kingdom of heaven is at hand” (Matthew 4:17). The Apostle Paul made clear the necessity of human cooperation when he told us to “work out your own salvation with fear and trembling; for it is God who is at work in you, enabling you both to will and to work for his good pleasure (Philippians 2:1-13)”. A photo of the domed ceiling in the Chapel of Paramythia at Vatopaidi.